There are ten friends. They are sitting in two parallel rows, which contain 6 seats in each row (twelve seats in both rows). In such a way that there is an equal distance between adjacent persons. 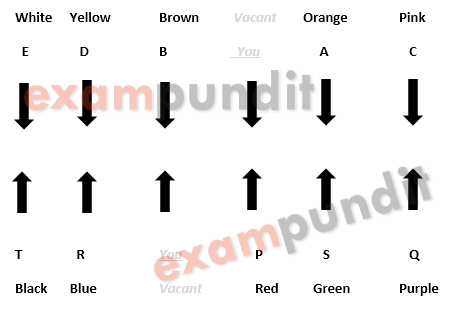 In row 1- A, B, C, D and E are seated and all of them are facing in south direction, in row 2- P, Q, R, S and T are seated and all of them are facing in north direction. One seat is for you in each row and named as vacant. Each member seated in a row faces another member of the other row. All of them like different colors i.e. Blue, Red, White, Black, Green, Purple, Brown, Pink, Orange and Yellow. The one who likes Blue sits opposite to the one, who sits third to the right of the one, who is opposite to S. The vacant seats are not opposite to each other. Three seats away from Q is the seat of you. Q doesn’t like Red, Yellow and White. B likes Brown. E is not an immediate neighbor of C. Vacant seat of row-1 is not opposite to S and is also not at any of the extreme ends of row-1. T, who likes neither Purple nor Red, does not face the seat of you. C is not an immediate neighbour of D. D faces R. Two seats are there between C and B, who sits third to the right of the one who likes Pink. The one who likes Orange faces the one who likes Green. S sits third to the right of R and likes Green. The persons who like Yellow and White are adjacent to each other. The seat of you in row-1 is not adjacent to D. E neither faces the one who is adjacent to the one who likes Purple nor likes Orange. Q sits at one of the extreme ends. The one who likes Black doesn’t face the one who likes Yellow. The one who likes Red in not to the immediate right of the one who likes Green. Question: Who is sitting third to the right of the one, who is facing third to the right of the person who likes Blue ? Question: Who likes Pink colour ? Question: Who among the following faces the seat of you? Question: Who is facing the person who is sitting immediate left of the one who likes white ? Question: If you are sitting in row-1, then who is second to the right of you ? Ten persons A, B, C, D, E, F, G, H, I and J are seated in two rows. Everyone is related to A in some sort of relation i.e. brother, son, mother, father, nephew, sister, daughter, wife, sister-in-law not necessarily in the same order. Members of one row face the members of other row. Person in row-1 face the south direction & row-2 face north direction. H is the sister of A. E is a male. Three persons are seated between A and his sister-in-law. A’s son sits at one of the corners such that his cousin is third to the right of him. F is an unmarried female and is to the immediate left of A. A’s wife and mother are in the same row at three places away from each other. J is second to the left of G, who is a female. C’s husband is seated at one of the corners. D’s son is second to the right of C, who is a female. No couple is seated in the same row. E faces H. B is not seated at any of the corners and faces in south direction. Question: Who sits second to the left of A’s father ? Question: How H is related to E ? Question: Who among the following is the sister-in-law of C? Question: Who sits second to the right of J ? 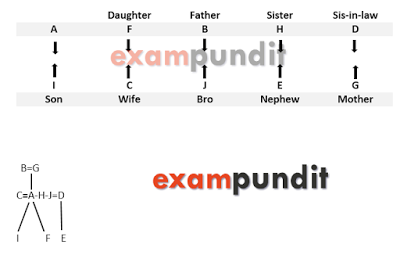 Question: A related to B, in the same way J is related to G. Then in the same way who is related to B ?